The reputation of the armed forces is being tarnished by right-wing political "extremists", a group of former military leaders has warned. Three ex heads of the Army are among those to put their names to a letter accusing "those who seek to hijack the good name of Britain's military". It does not name the BNP but was issued as part of a campaign against them. The BNP vowed to continue using military symbols and pictures of Winston Churchill in its campaigns. 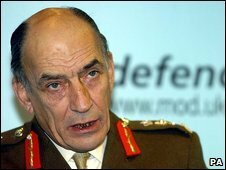 The commander of the Desert Rats in the first Gulf War, Major-General Sir Patrick Cordingley, and former Chief of Defence Staff Lord Guthrie are the other signatories on the letter, alongside the former Army chiefs, generals Sir Mike Jackson and Sir Richard Dannatt. They write: "We call on all those who seek to hijack the good name of Britain's military for their own advantage to cease and desist. General Jackson is among those angered by the BNP's use of military symbols, including a picture of a Spitfire alongside the words "Battle for Britain", which featured in the party's recent European election campaign. He told the Times: "The BNP is claiming that it has a better relationship with the armed forces than the other political parties. "How dare they use the image of the Army, in particular, to promote their policies. These people are beyond the pale." But he told the BBC that he and the other former generals were not targeting any particular party: "This is in no sense a party political issue. It is about the reputation and good name of Britain's armed forces." He said "tolerance and fairness" were important to the armed forces, which he said welcomed recruits from all backgrounds. Quizzed about race relations in the ranks, he admitted "there has been from time to time some friction" but said he hoped it was "absolutely in the past". 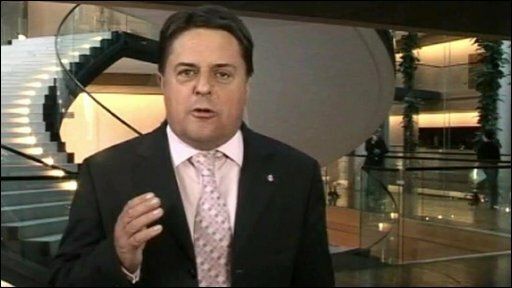 Nick Griffin, BNP leader: "We are fighting the same fight as the boys who flew those planes"
And asked if he thought there was support for the BNP among ordinary soldiers, he said: "I sincerely hope not." Asked whether the BNP was the target of their letter, Lord Guthrie told BBC Radio 4's World At One: "The BNP are the ones probably uppermost in our minds - but all extremism in the armed forces is a bad thing." He added: "The BNP are, quite honestly, a very unattractive group". The letter has been published as part of new anti-BNP campaign group Nothing British, which is headed up by ex-Ministry of Sound managing director James Bethell and Conservativehome editor Tim Montgomerie. BNP leader Nick Griffin told the BBC: "This campaign is being organised by the Conservative Party which used to take the votes of the armed forces for granted. "I think they now know that most, young squaddies especially, vote British National Party rather than Tory so they are having a go back." He accused senior generals of "getting involved in relatively trivial politics" rather than addressing the problem of soldiers being sent to Afghanistan with "shoddy, worthless equipment". And in a statement on the BNP website he said at the Nuremberg trials, Nazi political and military leaders were charged with "waging aggressive war". Asked about the party's use of military symbols, he said: "The Spitfire is nothing to do with the modern military. It is to do with Britons fighting during the Second World War against European dictatorship." He also claimed the party - which has come under fire from Winston Churchill's family for using his image in election literature - shared Churchill's stance on "mass immigration" and the "dangers of a Federal Europe". But his words provoked an angry reaction from some veterans, including former SAS commando Andy McNab and Simon Weston, who suffered horrific burns in the Falklands War. In a YouTube video, Mr Weston said: "I find it appalling to think that they can take the dignity and the honour and the respect with which those people treated their service and their uniform, and align it to the horrors and desires of these people." Asked whether army veterans supported the BNP he said there would always be individuals who were "seduced" by the party but added: "From my knowledge it is wholly disliked ... we don't like them, we don't respect them, we don't think that they stand for us." On Monday, BBC director general Mark Thompson said a recent court ruling on the BNP's membership policy did not "legally inhibit" the corporation from allowing Mr Griffin on Question Time on Thursday. Welsh Secretary Peter Hain had written to the BBC arguing the BNP was "an unlawful body".